Poe, Edgar Allan. Les Poèmes d’Edgar Poe; traduction de Stéphane Mallarmé, avec portrait et fleuron par Edouard Manet. Brussels: Edward Deman, 1888. 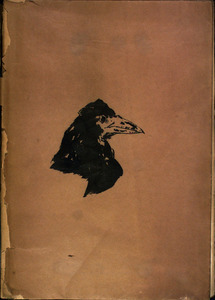 Poe’s well-know poem, The Raven, was among those translated into French by Stephen Mallarmé and illustrated by Edouard Manet, the famous French artist. This particular copy was inscribed by Mallarmé and presented to John H. Ingram, noted collector of Poe material which now is housed in Special Collections. Poe’s poem was initially published in 1845 and immediately became popular. An account of one of Poe’s readings of the poem at a private home in Richmond stated that he "shut out the daylight and read by the light of an astral lamp, using no gestures except that he extended his arm when saying 'Get thee back into the tempest'." After he was assassinated, the body of President William McKinley lay in state at the Capitol in Washington, DC, before the funeral in Canton, Ohio. 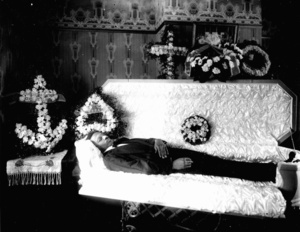 The casket rested on the same catafalque used for presidents Lincoln, Garfield, and Kennedy. The viewing was poorly managed, and a near riot ensued as throngs of mourners shoved their way inside to escape a sudden rainstorm. 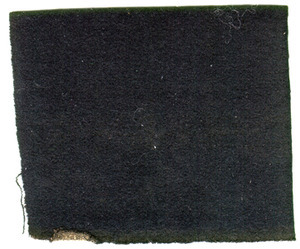 Later, the catafalque cover was cut up into squares for distribution as souvenirs. 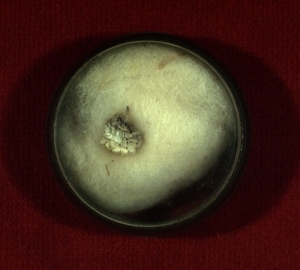 This one was given to John Waterhouse Herndon of Charlottesville, an employee at the House of Representatives. President James Garfield was buried with elaborate ceremony in Cleveland, Ohio. Floral arrangements were so densely massed that the proceedings and participants were screened from view. A blossom from one of these wreaths was given to Charles F. Schydeimer, Confederate veteran and long-time Corner resident and newsdealer. In 1933 the "capt’n" presented his memento to the Library. Having a photograph taken of a deceased loved-one was a way of preserving their image in the minds of the living. Rufus W. Holsinger was a leading Charlottesville photographer in the late 19th and early 20th centuries. The collection of glass negatives from his studio contains many funerary portraits such as this one of Mr.Yancy (1915). 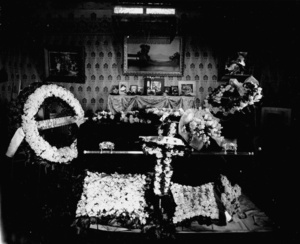 The casket of Mr. Charles Brown (1914).